Our PIASTA Program fosters internationalization at Universität Hamburg, intercultural exchange, and cooperative learning with the aim of enabling all students to pursue an active, internationally-oriented, and successful course of studies. 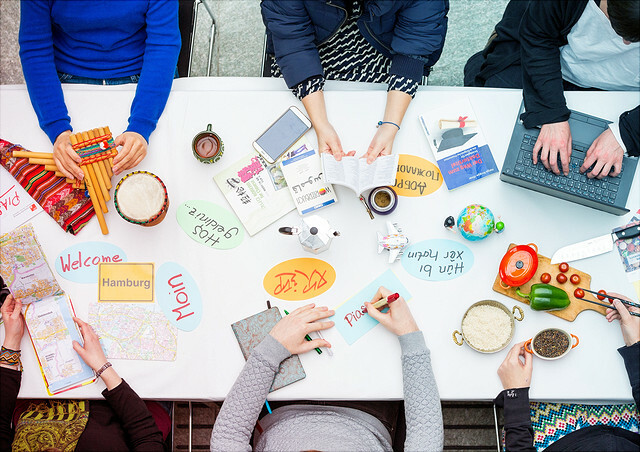 It goes without saying that our various activities, workshops, and excursions are open to all students at Universität Hamburg, both home and international students. Free spots available for poetry workshop "Scissors, Poetry, and Paper"! Participate in our workshop “Scissors, Poetry, and Paper" on Sunday, 28 April 2019, 2pm-6pm! Intercultural Awareness Training on 13 and 14 April! Unfortunately Intercultural Awareness Training on 13 and 14 April has to be cancelled! Alternate date will be announced soon. The dates for the summer semester 2019 language cafes are now online. Just drop by! We are looking forward to meeting you! Welcome Week, Intercultural PIASTA Evenings, activities, trainings and seminars you find in our diverse program! With newsletters, social networks and opportunities to participate, PIASTA offers a vibrant community. The PIASTA Team welcomes you! C'est dans la poche ! Comment bien se préparer et réussir ses examens écrits?